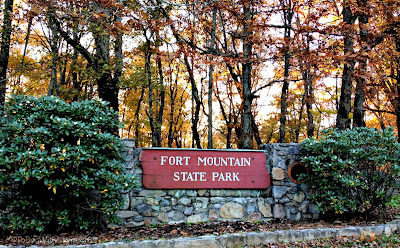 We've been counting the days until peak leaf season in north Georgia, and last weekend we picked the perfect day for a beautiful hike at Fort Mountain State Park in Chatsworth, Ga.
We met up with our pals Johann the Dog, his sister dog Gracie and mom Leslie for a terrific hike on the perfect fall day. 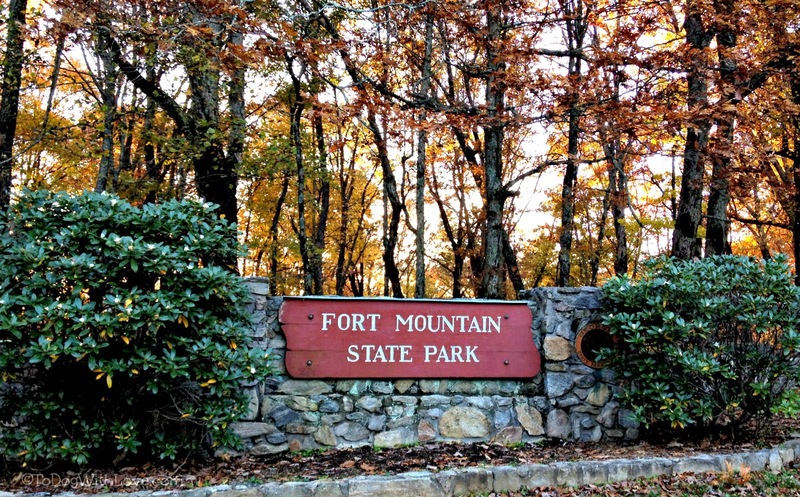 Fort Mountain is set on 3,712 acres with 14 miles of hiking trails and 27 miles of mountain biking trails. We started out on the Stone Tower Loop, which includes the rocky ruins of an ancient stone wall. 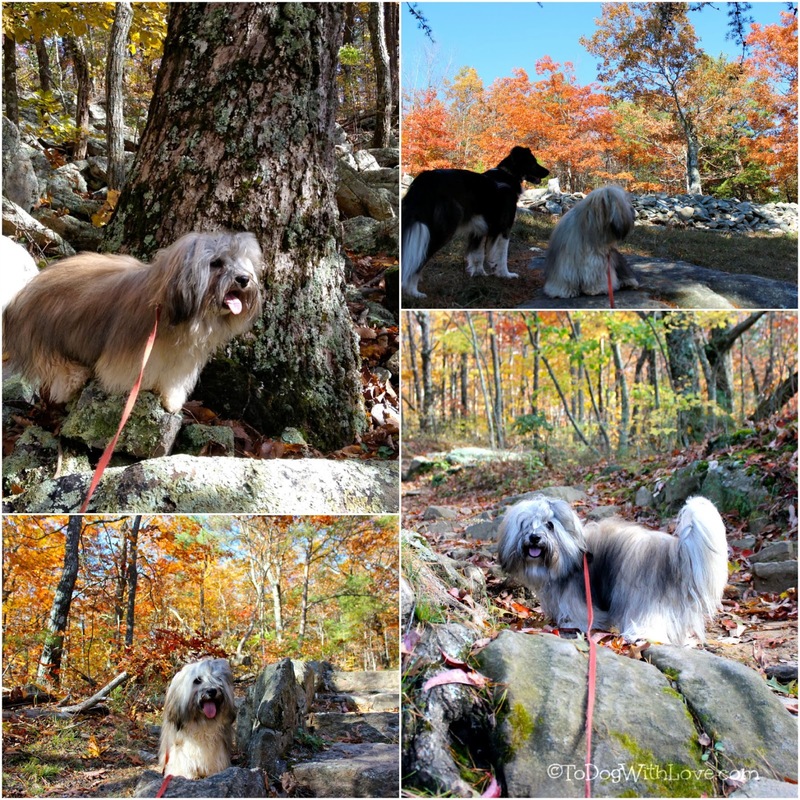 You can see the remains in the top, right photo, above, where Gracie and Rocco seem to be perusing the wonders of the wall... or may they just saw a squirrel. The rock wall spans 855 feet and is a bit of a mystery as to its origins. It's thought to have been built by early Indians for ceremonial purposes or perhaps it was built by early explorers as defense against Indian attacks. Further up the path, we came upon the Stone Tower. 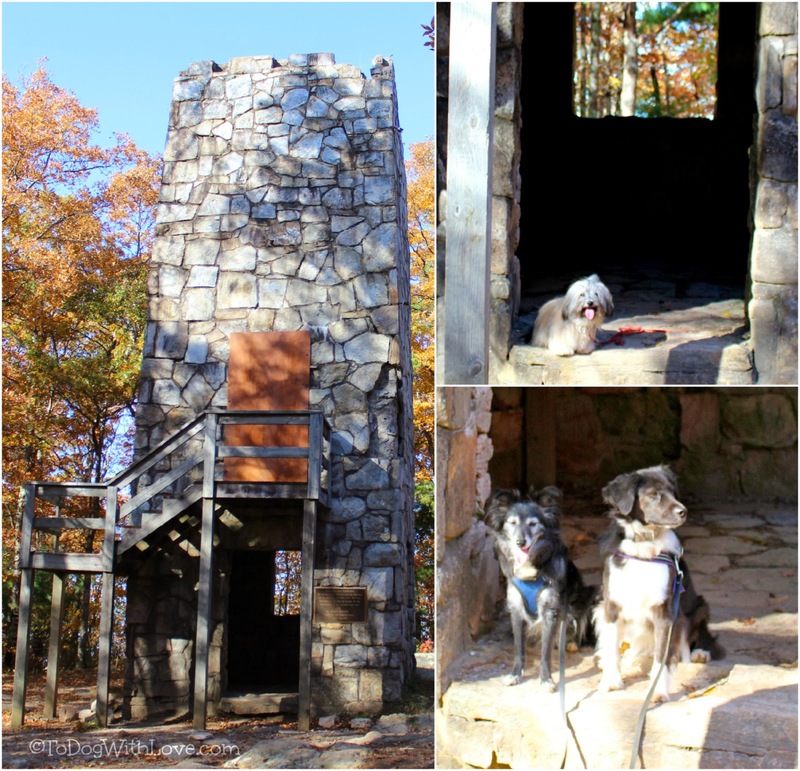 The tower was presumably built in the 1930's or 1940's by the Civilian Conservation Corps. (CCC). President Franklin Delano Rosevelt created the CCC during the Great Depression, and citizens were put to work preserving the country's natural resources to help combat the economic and social problems of the time. 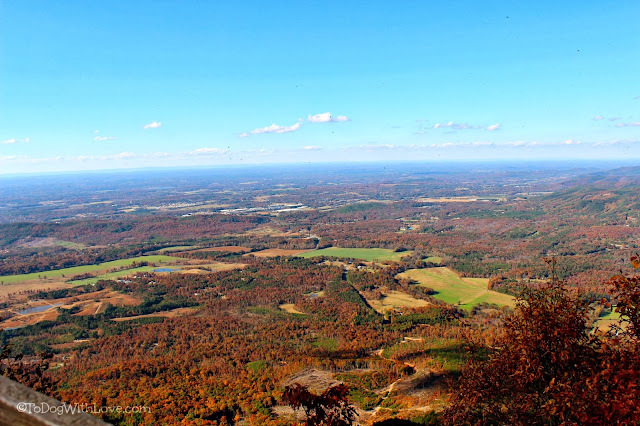 Continuing on, we reached the West Overlook portion of the trail with magnificent views of the valley and mountains surrounding the park. We enjoyed 180 degree views.... spectacular! We had time for one more trail before sunset so we headed down the road to the Big Rock Trail. There we found more beautiful vistas as well as small cascades and waterfalls. We'll need to come back to explore more of the paths that we didn't get to on this trip. 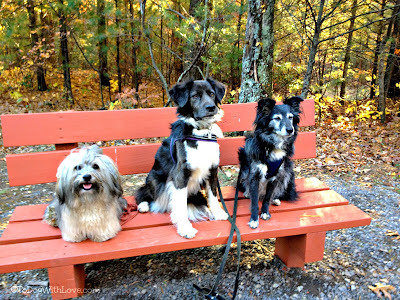 After our hike, we finally got a photo of all three dogs -- Gracie and Johann are very serious about their hiking! All the dogs had a blast and a great workout! But the adventure wasn't over yet! On the way out of Chatsworth, look what we found, almost in the middle of the road! 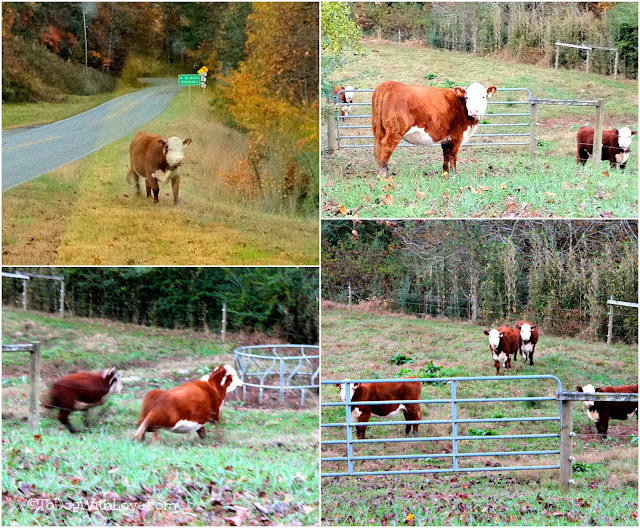 This cow seemed to have lost his way, but we stopped and helped him back into his pen! 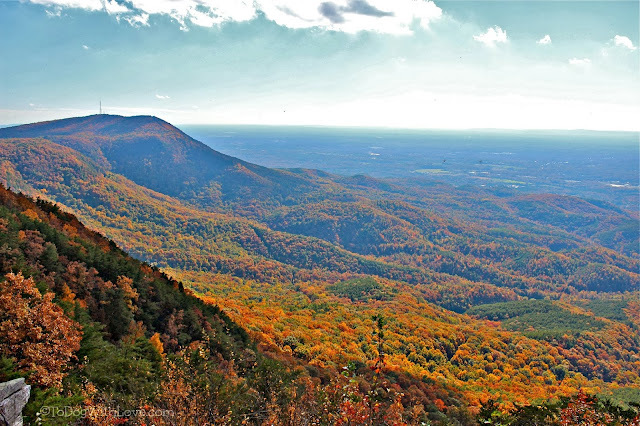 Along the road heading out from Fort Mountain, we took in the view from the Cohutta-Chattahoochee Scenic Byway. It was breathtaking at sunset. UPDATE: Old posts or new are welcome in the FitDog Friday Blog Hop! Please feel free to share any post you've written that helps promote a healthy active lifestyle for your pets. The more FitDogs the merrier! Just stunning views. Have a fabulous Friday. What wonderful shots. Some great views and the colours are fantastic. I can almost feel the sharp, crisp autumn weather that you would have been hiking in (& I'm totally jealous). Perfect!! So glad you can feel the crispness! It was just like that! Rocco - what a great outing! It's always fun to hike with pals - makes for a more interesting hike - its good to have some extra eyes looking out for things - like big COWS! The cows were kind of big and scary! hehe! 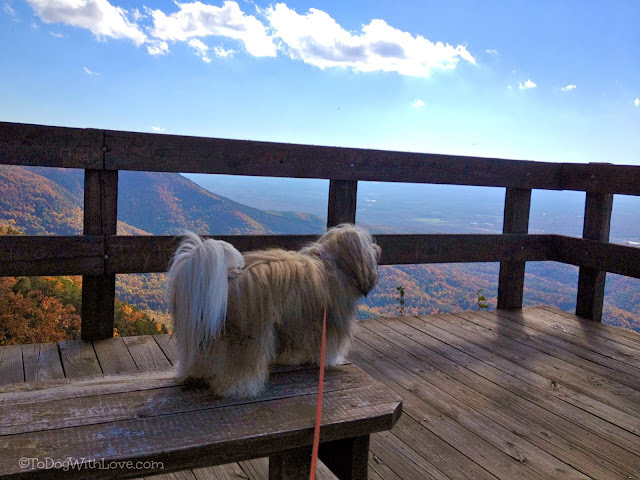 Rocco and Miss Diane: how far is this wonderful park from ATL? You know my Daddy-dog will have to put it on our list of places to visit the next time we are up your way. It looks magnificent! I love the sunset photo...just Beautiful. It's about a two hour drive north of Atlanta, maybe a little quicker if you drive straight there. We drove an hour and a half to Elijay and then half hour to the mountain. We need to go back ourselves to explore more! 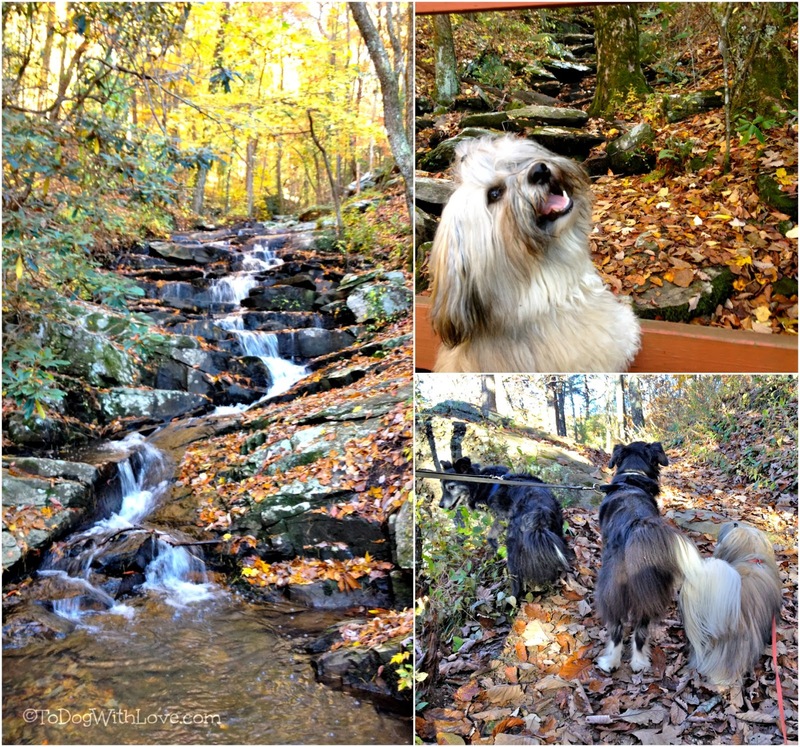 What a pretty spot and perfect weather for a nice hike! Those fall colors are great! 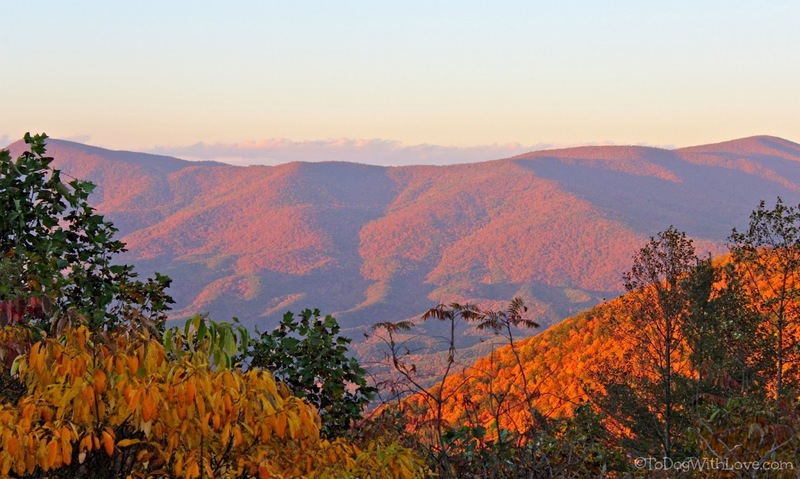 I want to travel back east during fall sometime. Glad you had a good hike.